That answered my question of "Did Kelly from Love Well have her baby yet?" 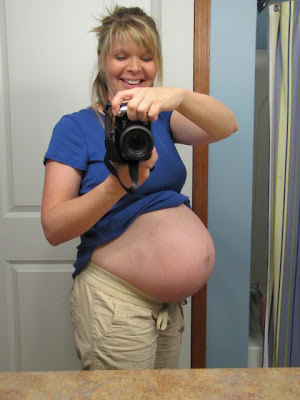 :-) GREAT preggo belly!! We are in serious negotiations for #4 around here so I am jealous/excited for you!!!!! Twice, my water did not break until the baby crowned. My friend's baby was born with an intact bag. I don't know why OB's are always reaching for that knitting needle. I tried holding out with both my babies to let my water break on its own, but after a time, I finally ended up glaring at my physician and saying "Break it. NOW." And the baby was born within an hour of breaking it, both times, so I don't feel bad one bit. 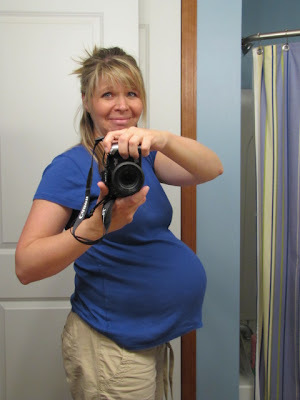 Those are great pregnant belly pictures! Girl, you are SO PREGNANT! ;) LOVE the pics. Watermelon belly indeed! LOVE that belly pic! Was checking to see if you had had it!! Hang in there! I think you look GREAT! THat is one CUTE bump. Better to be a bundle of contractions than a bundle of contradictions! I totally get the water part. The doctor had to do it both times. I remember driving to the hospital (well, my husband was driving!) after we dropped off our boy with friends on our way to have the girl. I was excited to have the baby and wasn't even hating the contractions. But all of a sudden I thought "Oh, yeah!" in dismay as I remembered the immediate aftermath that would come - feeling like they needed to bring in a firehose to clean everything up. Can't wait to hear the exciting news!! I have an overwhelming urge to go buy a watermelon right now. GOODNESS, Kelly! You are all baby! Like you, my water never broke until the doctor got out the knitting needle. And once he broke it? Within seconds I was pushing, and within minutes we had a baby! Keep us posted! How did Target go yesterday? I spent two weeks in pre-labor with my second child. The waiting felt interminable! Thanks so much for the amazing shout out about my waitressing post. I really appreciate that! I've been home from the hospital a week today...and STILL my boys keep asking when my stomach will be flat again. What a gorgeous mommy-to-be ! I can't wait for the first photos of that special little guy !! I'm on my way to that myself. It's funny how you forget, and think "I can't possibly get any bigger..." Oh yes. Oh yes you can. And I will. Look at that amazing belly! I know you are so ready, so I hope the signs are the real deal. I had intermittent contractions all day yesterday, and the baby was moving less, which I have never really experienced. But then they stopped and today he is having a party in there, so I guess it was nothing. Which is a good thing, because I need to do about one billion things in the next five days. I think that I could just superimpose my head on your body right now. I'm at 36 weeks and boy can I feel your pain! I just read the Thursday update and have to say I am surprised, too. 7 more cm to go, which isn't bad. Your belly is the best. Very exciting! You look great for being moments away from having a baby! you are almost there! before i know it you will have a baby. Brave woman! posting nekkid belly pics at 37 wks :) Love it! You look fantastic! #1 was a sched c-sec, and we have sched this one as well. 4.5 wks to go, and I CANNOT WAIT! um...I don't know how that baby is fitting in tiny you!!! and you still look adorable. I love the expressions on your face in the photos. Like you're trying not to laugh. SOON. It has to happen SOON. I mean, that's all you can know. These "signs" are so silly. and defeating. Ok, you're right. It is watermelon-esque, but you are still so tiny everywhere else. Looks like you're gonna drop that watermelon at any moment.